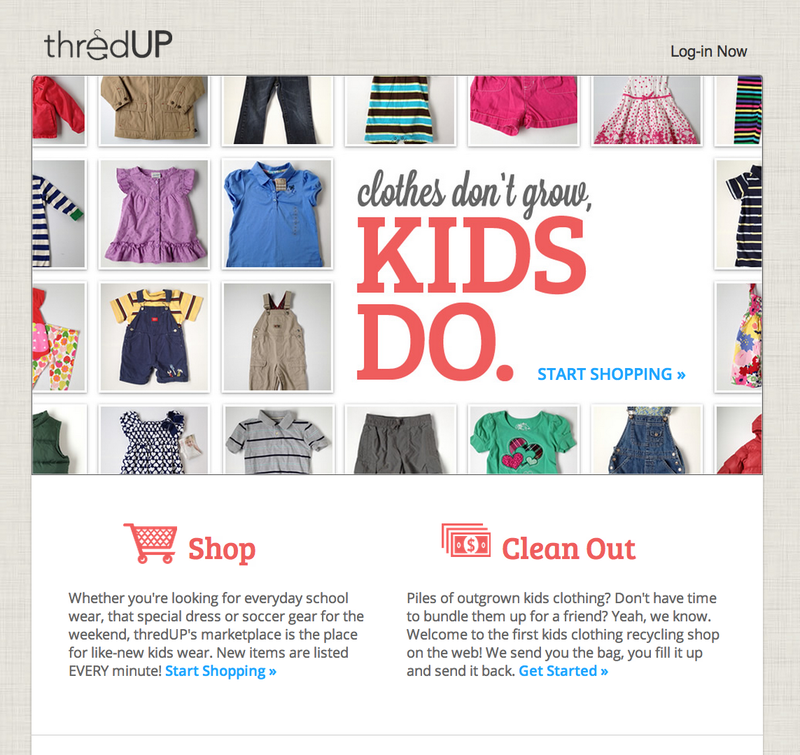 The online kids clothing exchange thredUP is shutting down its clothes swapping service. But wait! Don’t panic, moms! (And dads, too, if you’re all 50/50 about the child-rearing duties. Haven’t met one of those yet, but I hear they exist). The good news is that thredUP itself is not shutting down, it’s just focusing on the more successful area of its business: its newly launched kids consignment platform. For those unfamiliar with thredUP, the site was founded back in 2009 with the goal of making it easier for parents to clean out the unwanted, outgrown clothes from their kids’ closets. In mid-2010, the company raised $1.4 million in funding for the platform, which involved having parents exchange boxes of used clothes directly with each other – transactions which were facilitated through thredUP’s service. Since then, the company has been steadily growing, with 500+ new customers per day joining the site. To date, 2 million items have been exchanged, the company tells us. But thredUP thought it could do better. So last month, it launched two new, resale-style services, a like-new kids clothing store and a kids clothing recycling service. During this pre-launch period, 40,000 items were “cleaned out” and 2,000 store items were purchased the first week the services were live. 6,000 items were purchased within the first month. Based on this early engagement data, thredUP decide to shift its time and resources into these new areas, and is today launching a new version of thredUP and a revamped website. There are two key services being provided now: the concierge (clean out kids clothes service) and the online shop. With concierge, thredUP actually mails you a courtesy bag which you can fill with outgrown clothes and then ship back, free of charge. ThredUP will pay you 20%-30% of the clothes’ value. You can take the payments in the form of cash (via PayPal), or, as thredUP hopes, you’ll choose to use it in the online shop. The store features like-new clothes starting at $2.49 (with free shipping at $30+). The company photographs the clothes so you know what you’re getting, and vets them for quality. In my own personal tests with thredUP, my complaints were few. You can really stuff that bag, and if you have a nice enough mail carrier, you don’t even have to worry with dropping it at UPS. Some of the clothes I sent in were rejected for stains and wear-and-tear, and they were some of the cleanest I had. So I believe them when they say they’re pretty serious about the quality of the clothes. However, it’s unfortunate that there’s not a way to get rid of these lesser-quality clothes through the service, especially since there are age ranges and brands that thredUP rejects. I wouldn’t even mind paying cheaper prices for a grab bag of those “rejected” hand-me-downs given that’s what most of my kid’s clothes already are – hand-me-downs. But I guess there’s always Goodwill for that. ThredUP is classier now. The new version of thredUP is live today, and the company has posted a message to members here. P.S. If you’re a dad offended by the opening comments, sorry about that. But even thredUP refers to its customers as “moms.” For what it’s worth, a real 50/50 parent also deals with minor issues like clothing your child. So dads, where are your thredUP accounts, huh?